Includes weapon bag that zips on top. Two main compartments on inside. This Bag has two (2) large compartments and three (3) outside pockets. 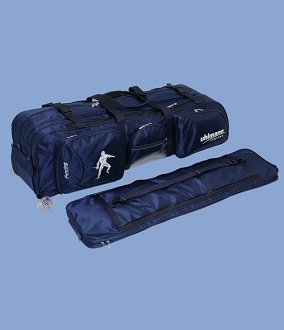 The Jumbo version includes a detachable weapon bag. Made in Germany. (115cm x 33cm x 52cm). It is light weight and strong. One of the most popular design in the US. The colors we received from Germany are different every time. Please call ahead to inquire about available color options. Most of the color options in stock are in :black, royal blue, navy blue, grey and red. Call to find out more! Available in Red and blue only.